The Metrodome’s roof deflated within 35 minutes Saturday morning, despite uncertainty about wind and snowy weather conditions. Officials from the Minnesota Sports Facilities Authority opened the relief vents to begin the deflation at 7:15 a.m. — a move that permitted the Dome’s 10 acres of Teflon-coated fiberglass fabric to slowly deflate. The deflation will make way for construction of a new $1 billion Vikings stadium, which will be located roughly where the Dome stands in downtown Minneapolis. The snow-laden roof silently deflated in the middle of fairly heavy flurries, sagging first in the middle. While there were few people out and about at the early hours, those who were walking by the Dome didn’t seem to notice the deflation occurring. Construction has already begun with the excavation of a giant crater on the eastern stretch of the property to make way for the new structure’s pilings. 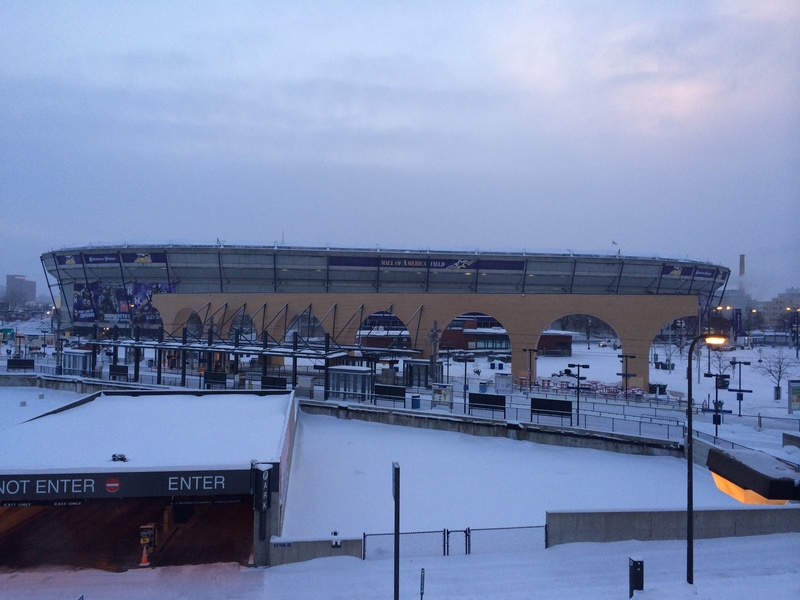 The Vikings played their final game in the Dome on Dec. 29, so stadium officials need to deflate the roof to prepare for the 31-year-old structure’s demolition piece by piece, beginning next week. The Dome’s roof fabric will be recycled by St. Paul-based excavator Frattalone Companies, which will cut it up and use it for future construction projects. Already the turf and most of the bright-blue seats have been removed, leaving a kind of concrete shell inside the stadium. Officials were worried that winds higher than 5 miles per hour could hamper the deflation. While this was the fifth time the Dome’s roof collapsed this is the first time it was deflated intentionally. On four prior occasions, the roof collapsed due to extreme weather conditions, including the Dec. 11, 2010 incident where excessive snow caused the roof to cave in.